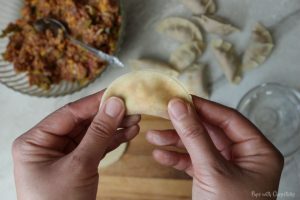 These potstickers don’t have the bulk from the buns so each bite-sized potsticker is a juicy little bacon cheeseburger bite wrapped in a chewy crispy little bundle! 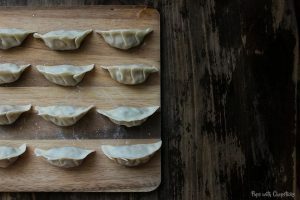 These little guys are SUPER addictive and easy to make. I love cheeseburgers! 🙂 I seem to be on a burger kick lately. 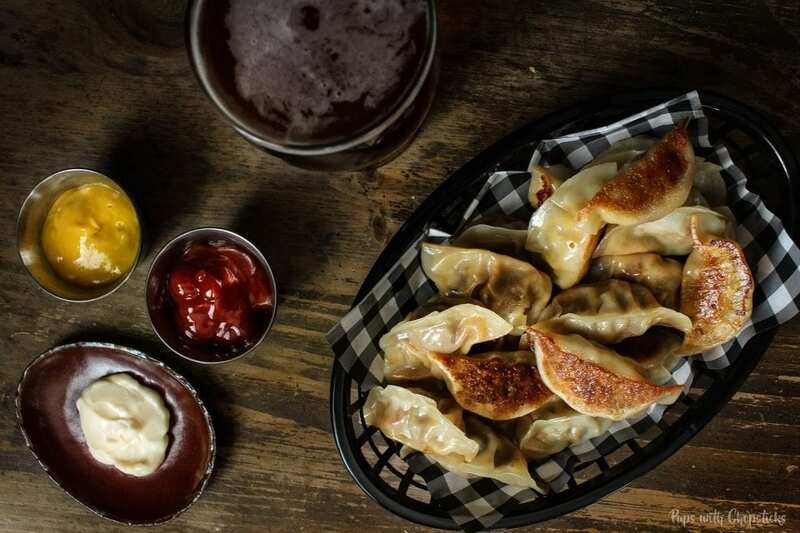 There’s something about the combination of bacon, melted gooey cheese with beef, pickles, ketchup and mustard wrapped in a crispy dumpling skin that makes this the ultimate snack! 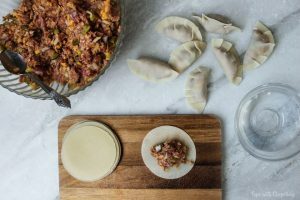 For this bacon cheeseburger pot sticker recipe, almost all ingredients can be found at you local grocery store. If you can’t find miso in your local grocery store, you should be able to find it at your local Asian grocery store or gourmet grocery store. 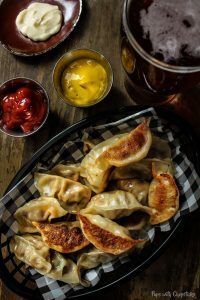 Potsticker/Dumpling skins can be found at your local Asian grocery store, however lately due to it’s popularity we have been seeing it at our local grocery store as well so you may be able to find it there too! For the pickles we used a dill pickle, however you can use any kind you like! 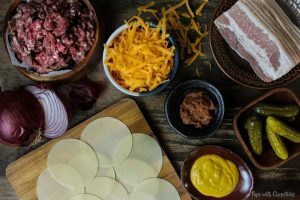 Make the Bacon in Oven While Prepping Potstickers! The simplest way to fold these without going all fancy on pleats is just folding them in half and squeezing the ends together to form a half moon. Set the stove to medium-low heat to pre-heat your non-stick frying pan. To see if the frying pan has come to temperature, add a few drops of water. If it sizzles and evaporates you’re good to go. IMPORTANT : must use non stick pan, this won’t work in a iron skillet. 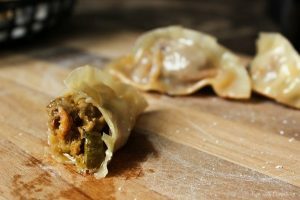 Place the dumplings in a single layer, making sure they are not touching each other. 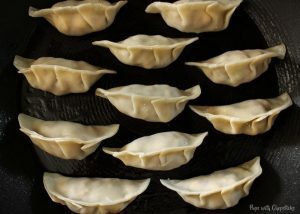 Once we are done steaming, remove the lid and let it cook again to crisp up for 1-2 minutes. 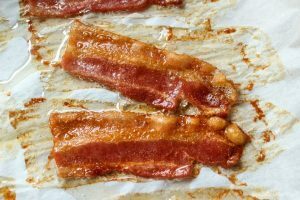 Around this time I carefully peel them off the frying pan to make sure they are not stuck to the pan and then continue to brown them until the bottoms are crispy again. If you’re like us, you probably have an old non-stick pan that doesn’t ‘non-stick’ anymore. No worries! We can make it a non-stick again by seasoning it. 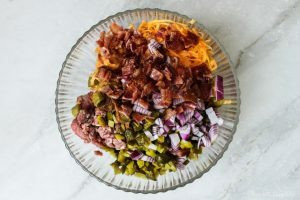 Seasoning is not only limited to cast iron pans – I tested this theory and I actually have been treating all my non-stick pans the same way I treat my cast iron pan and it works! Soap is the #1 killer with this technique since it strips off the oils, so whenever I wash the pan I usually use a gentle scrubbie brush with piping hot water and just wash away the food. If you have food bits stuck to it, then I’d let it soak in water for a few minutes until the bits are soft and then brush it off with the scrubbie. The oil essentially stays on and the food is gone. Then I put it on the stove to dry over medium heat until the water has evaporated and then drizzle some oil on it and use a paper towel to spread it around the pan and lastly turn your stove on high heat with the pan on it until it just starts to smoke, then turn off the heat and set it aside to cool. Voila, it’s non stick again for next use! 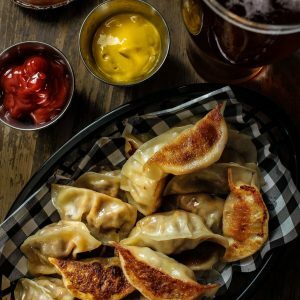 The combination of bacon, melted gooey cheese with beef and pickles wrapped in a crispy dumpling skin makes these potstickers the ultimate snack! You Have inspired me to try new stuff . I just spent all day making my own wrappers, solid broth, Hand chopping everything. I love it . Then I seen this oh my goodness. I love cheesy hamburgers.